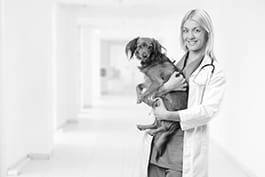 Veterinarians diagnose and treat sickness, disease and injury in all types of animals, and advise on preventative action. Examine animals to detect and determine the nature of diseases, disorders or injuries. Carry out diagnostic tests, such as x-rays, blood samples and ultrasound, and interpret the results. Treat sick or injured animals, e.g. by prescribing and administering medication, setting bones, dressing wounds, or administering anaesthetics and performing surgery. Perform routine medical tests and checks, and inoculate animals against various diseases such as rabies and distemper. Advise animal owners regarding sanitary measures, feeding and general care necessary to promote the health of animals. Educate the public, e.g. about diseases that can be spread from animals to humans. Train and supervise workers who handle and care for animals. Inspect hygiene and care standards in animal quarters, e.g. farms, zoos, kennels, riding stables, pet shops, cattle markets, animal shows and sporting events. Maintain records, and provide reports and certificates in compliance with current legislation. Manage practice finances, marketing and staff recruitment. Conduct research in animal health and related areas.